Sarah Forbes Bonetta, a princess of the Egbado clan of the Yoruba people, is best known as the goddaughter of Queen Victoria of Great Britain. Bonetta was born in 1843 in what is now southwest Nigeria. Her parents’ names are unknown as are the names of her siblings who were all killed in the 1847 slave raid that made Bonetta a captive. Sarah Forbes Bonetta was taken to Great Britain and met Queen Victoria on November 9th, 1850 at Windsor Castle. The Queen was impressed by her intellect and entrusted her care to the Schoen family in Palm Cottage, Gillingham when Forbes died early in 1851. The Queen declared Sarah her goddaughter and paid her tutorial expenses. Young Sarah became a regular visitor to Windsor Castle. Less than a year after she arrived, however, young Bonetta developed a cough believed to be caused by the climate of Great Britain. Queen Victoria arranged for her to be sent to what she believed was a better climate for Bonetta in Sierra Leone. There she was educated at the Female Institution, a Church Missionary Society school in Freetown. Bonetta excelled in music and academic studies but was unhappy prompting the Queen to bring her back to England in 1855. In January 1862, 19-year-old Bonetta was a guest at the wedding of the Princess Royal Victoria, the eldest child of the Queen. In August of that year Bonetta herself was given permission by Queen Victoria to marry Captain James Pinson Labulo Davies, a 31-year-old wealthy Yoruba businessman from Sierra Leone. The couple married in an elaborate wedding at St. Nicholas Church in Brighton, England. Sarah arrived at the ceremony in an entourage that included ten carriages. The couple lived in Bristol, England briefly before returning to Sierra Leone. While Davies continued his work, Bonetta began teaching in a Freetown school. Shortly after the marriage, she gave birth to a girl and was given permission by the Queen to name her Victoria. The Queen also became young Victoria’s godmother. In 1867 Sarah and her daughter visited the Queen again. For Sarah this would be her last visit. Her cough continued and she was diagnosed with tuberculosis. Bonetta had two more children but died in 1880 at the age of 37. Queen Victoria continued to provide for Sarah’s daughter. She supported young Victoria’s education and gave her an annuity. Young Victoria continued to visit the royal household for the rest of her life. Many of the Bonetta-Davis descendants live in and around Lagos, Nigeria. 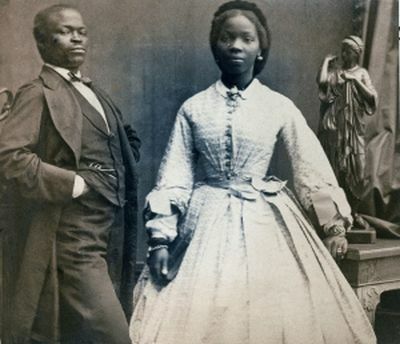 “Sarah Forbes Bonetta: The African Princess in Brighton,” Afro-Europe International Blog, http://afroeurope.blogspot.com/2011/09/sarah-forbes-bonetta-african-princess.html; “Sarah Forbes Bonetta Davis, An African Princess in the British Monarchy Who Captured the Heart of Queen Victoria,” Trip Down Memory Lane, Kwekudee, 3 Sept. 2009; http://kwekudee-tripdownmemorylane.blogspot.com/2012/09/sarah-forbes-bonetta-davies-african.html; Walter Dean Myers, At Her Majesty's Request: An African Princess in Victorian England (New York: Scholastic, 1999). Victorian England (New York: Scholastic, 1999).